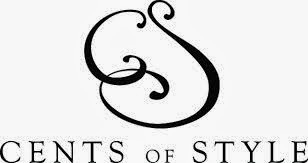 Have you heard of the website, CENTS OF STYLE? It is a discount shopping website that specializes in accessories, shoes and boots. I have been really pleased with their products and best of all, their prices. Every Friday they offer one item in their FASHION FRIDAY section at a greatly reduced price. 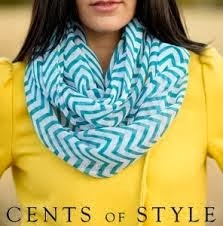 Last week, the above Chevron Scarves were reduced to $6.95 from $26.00 including FREE SHIPPING. 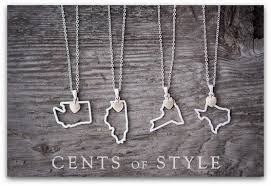 For Christmas gifts I ordered one of these cute State Necklaces for a gift as well as a knitted Ear Wrap. Both of the gift recipients loved them. I recently had a customer service issue and emailed them. I had a response AND a correction within MINUTES! That is unheard of and especially with discount retailers. Unfortunately, sometimes when you get a great deal on prices you get a poor deal on customer service, but that WAS NOT the case with CENTS OF STYLE. I was very impressed with their service as well as their products. You need to sign up for their emails to get the discount code for each FASHION FRIDAY deal, but they only come into your inbox on Fridays so it isn’t too overwhelming. I highly recommend you check it out if you like accessories and great deals! Check them out at http://www.mycentsofstyle.com/.